The interactive art/science exhibit in the Easternmost elementary hallway (between 4th grade and the art room). Bring your iPads or phones and be prepared to be entertained and informed! 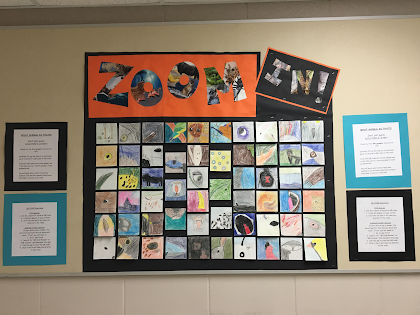 4th graders have "zoomed-in" on animal features in art, non-fiction text features in reading, and researched how a chosen animal's structures contribute to that animal's survival, nutrition, reproduction, and behavior in science. On the back of each art piece is a QR code that will link to the student's presentation video. Directions are at the exhibit but feel free to stop by with any questions.